In a journey spanning 50 books, hundreds of ideas and over a century, 50 Psychology Classics looks at some of the most intriguing questions relating to the human mind. 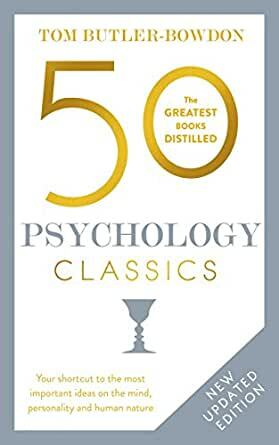 This brand new edition covers the great thinkers of psychology right up to the present day, from iconic psychologists such as Freud, Piaget, and Pavlov to contemporary classic texts like Thinking, Fast and Slow; Quiet and The Marshmallow Test. 50 Psychology Classics examines what motivates us, what makes us feel and act in certain ways, how our brains work, and how we create a sense of self. This is the perfect introduction to some of psychology's greatest minds and their landmark books. NOTE: This review is not a list of which books by which authors are included - my intent is to use MY impression to help you understand how he approaches what he DOES include and why you might want to buy a copy yourself. I have always been a *voracious* reader, so his summary reviews of books I haven't read guide future purchases BECAUSE his summaries of the important points of those I have already read are excellent and spot-on, IMHO! He is also a clear and interesting writer himself. Each summary (of approx. five pages of decent-sized print that even my Boomer eyes find readable) begins with the book's date of publication and its title, followed by two quotes from the book itself, moving right along to his "In a Nutshell" one to two line impression of the underlying theme put forward in the book "on review." Underneath (and on the same page) is his "In a similar vein" - listing other books among the 50 that examine themes right at home with the ones in the book he is about to summarize - WITH the page # where you can find them. Nice not having to flip to the back index, the Table of Contents, or leaf through the book - and an example of the way his mind approaches giving readers what they will be interested in knowing. He makes good use of bold, larger type TOPIC HEADINGS within each summary, making it easier to locate what you need again and priming your brain for the information in the next few paragraphs (a convention that also makes for easier reading for those who struggle staying tracked). This convention underscores his suitability to the project -- that he knows about the "rock to rock" way in which readers who struggle read best, as well as his seemingly innate understanding that many would-be purchasers may well be among that particular segment of the population. In his "Final comments" that follow each summary, he may also add a bit about why he feels the book deserves inclusion and readership (for those whose ideas have detractors), and a comment or two that puts the book in context with the rest of the field. At the very end of each summary he leaves you with a brief bio of the author, other books published, and usually a factoid or two to give you a lens through which to view this particular book and/or the author's work in general. In approximately 5 pages, he condenses the major points of the book, including his "Final comments." Impressive! The intro concludes with the following ". . . psychology is the only science exclusively devoted to the study of human nature, and its popular literature - surveyed in this collection - aims to convey this vital wisdom." For MY money, his aim is pretty darned true! BTW - Even if your personal library is as extensive as mine, you might want this book anyway, as a sort of "collection index" -- to remind you which book has the ideas you want to get back to or recommend to another, for example. If you are a student of psychology, I'm surprised you don't ALREADY own it. Gets you to think about the history of psychology from the preimaging days to the fMRI days. One can see the progress from purely "mind" (psychoanalysis) and purely "matter" (behaviorism) in psychology to the more hopeful methods of individuation (Jung), cognitive therapy (Beck-Burns), self actualization (Maslow) and UPR-client centered. 5.0 out of 5 starsL.O.V.E. this book!! This book arrived in great condition (as described). Absolutely head over heels for this one! If you have any type of interest in psychology you will love this book. Very well written and easy to understand. I found this VERY helpful during all three of my psychology courses in college just used it for additional information and a lot of it related back in my lectures, paper writing, and tests/quizzes. This is not a self help kind of book, but more of a collection of psychology classics :-) It is addicting and tough to put down! This is like holding a psychology library in your hand. Read this book and you will know the most important information from 50 psychology books. What better leverage of your time can you get. This is truly a must-read for anyone wanting to understand more about what makes us tick. Though, the book only brushes up on the most influential theories/thoughts/learning of modern psychology that is enough for most everyone. From relationship advice to human nature, this will surely help you for many things in life. Knowledge is power!